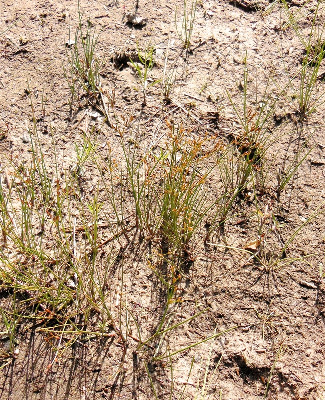 Spreading by slender rhizomes on sandy, peaty, or mucky shores (or drying beds) of soft-water lakes and ponds, old bogs, etc. A plant of acidic sites. Completely submersed vegetative plants may be locally abundant [f. submersus Fassett]; their rather flattened rosettes of reddish leaves are typically associated with Eriocaulon aquaticum, Littorella uniflora, and Myriophyllum tenellum. Emersed plants may have some or all of the flowers converted to viviparous bulblets. Juncus subtilis E. Mey. is known from Ontario north and east of Lake Superior, and could be found in Michigan. It would resemble a delicate, dwarfed and prostrate J. pelocarpus. MICHIGAN FLORA ONLINE. A. A. Reznicek, E. G. Voss, & B. S. Walters. February 2011. University of Michigan. Web. 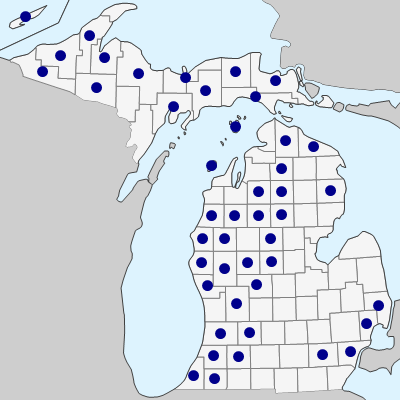 April 21, 2019. https://michiganflora.net/species.aspx?id=1519.